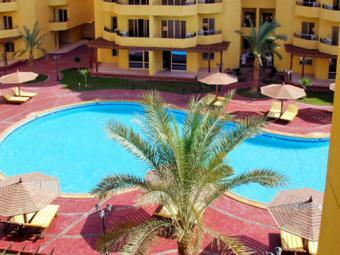 The apartment in the fenced and round the clock protected complex ` British Resort, located in a resort zone Hurghada - Al Kawthar area, number(line) hotels ` Sind Bad `, `Siva`, supermarket `Metro` surrenders. The complex has a silent green court yard with three pools, restaurant, fitness, all service services, own free-of-charge beach in 7 minutes of walking from a complex. The apartment is completely ready to residing, is furnished, is completed with all necessary equipment and home appliances. Surrenders in hiring for the term of from one month and more, is designed for comfortable residing of two men not of the local population. Cost of residing depends on term of hiring from 450 up to 550 US dollars per one month or 180 egyptian pounds per day at weekly rent. Is obligatory insurance ������� at a rate of a monthly payment.